Brian Jones Signature, Other Shape Guitar from Hutchins Guitars. Hutchins Guitars has announced the availability in the U.S. of the Brian Jones Signature limited edition model. 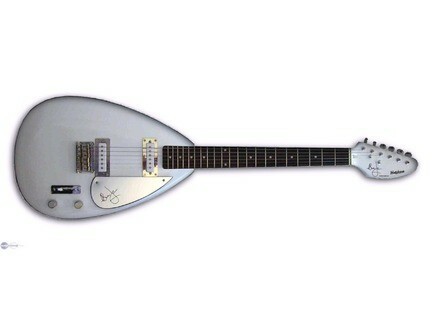 Produced in association with The Brian Jones Trust, this uniquely customised guitar is a recreation of the Vox teardrop Brian played in The Rolling Stones. Only 250 pieces were released worldwide, including 180 destined for the Brian Jones Fan Club leaving only 70 pieces for general release (including 37 for the U.S. market alone). Each instrument has an individual serial number engraved on the metal backplate, certificate of authenticity and comes complete with an authentic 60’s style hard case. Available in a Vintage White finish, this guitar is available for $1,200.00. Dimarzio DP 420 Virtual Solo DiMarzio presents the DP 420 Virtual Solo hum-cancelling single coil pickup. Fender JA-90 Fender Introduces Jim Adkins Collaborative JA-90 Telecaster. Levy's MS17E Levy's Leathers introduces the MS17E models, a series of guitar straps available in six different original graphic designs.